Photo: VIA Rail Canada Inc. The signs were there—the way he sang “Down by the Station,” the ever-present engineer’s cap, and the fact that he knew the names and personalities of the Thomas the Tank Engine fleet. It was clear: my four-year-old son was mad about trains. I remembered how much I liked them myself while sitting in a car with my family aboard VIA Rail Canada’s Vancouver Island route, which runs daily from Victoria to Courtenay, passing scenic towns such as Ladysmith and Shawnigan Lake. We were travelling over the Christmas holiday, so the car was crammed with suitcases and thrumming with hyped-up children (some wearing engineer’s hats). While we waited for the train to pull away from downtown Victoria, I realized that I was excited, too. Our destination that clear December day was Nanaimo, where we would meet up with friends and spend the afternoon strolling downtown in the sunshine before taking the 10-minute ferry ride to Protection Island to have lunch at the Dinghy Dock Pub and Family Restaurant. Throughout the roughly 2.5-hour journey to Nanaimo, I was struck by how dozens of people—and all the dogs—stopped to watch the train hurtle past. Several people on the route stood to wave from their farms, or from town street corners. One little girl held up her puppy and waved its paw. 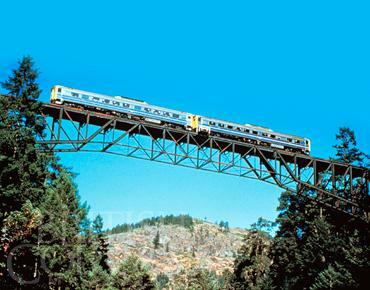 Part of the magic of train travel is seeing places and getting glimpses of life that are hidden from the highway—whether that be tumbling waterfalls, farms and vineyards, the backyards of humble homes, or the unnerving view, down, down, down, as you cross over the Malahat Valley. Our car erupted in cheers when the engineer announced that if any children wanted to pull the horn, now was the time. The sound of stampeding feet and boisterous horn blasting ensued. “I wanted to sit by myself,” I joked, gesturing to my sprawling preschoolers and overgrown husband. But I didn’t, really. A car ride is something to get done. I think a train ride is something to share. For information on schedules and fares, visit www.viarail.ca.